Just Julie B's Stampin' Space: CASing My Own Field Flowers! And a Cool Surprise! CASing My Own Field Flowers! And a Cool Surprise! I was asked to make a sympathy card the other day, so I decided to CASE from my own card! HERE is the original that I made a while back as a Thank You card. I love the Field Flowers set! In making it a sympathy card, I had a hard time finding any words that would fit in the small space. 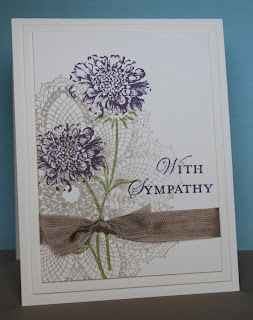 So, I took the 'With Sympathy' from the Loving Thoughts stamp set. And because the words were next to each other, and too long to fit in the small space, I decided to cut them in half! And when I went to put them on the clear block, it was totally cool that the two (now) separate words nestled right together perfectly - and even stamped perfectly straight onto the card that way! It was like they were meant to be cut and rearranged that way! And the cool thing is that the two separate words can still be easily repositioned onto the clear block to be next to each other again. - So cool, huh? Simple 18 Flip Flop Card! - And I Did it Again!